The System Settings is described below, follow this guide of how to access the System Settings. NOTE! The System Settings is normally already configured by the Activio staff. Use these settings only if you know what you are doing. Manage Chest Belt ID - set the ID of the borrowing chest belt used by the system. Change PIN Code - change the default PIN code - warning after changing this, Activio can not help you if you forget the code without a complete reinstallation. Change Activio ID - enter or update the Activio ID used for the Activio License (myActivio and/or Virtual Trainer). Restart system - restarts the Activio system. Shutdown system - turn of the Activio system. Reinstall system - this restarts the system to the factory settings and the installation process need to be done again. Use the zone color for the HR% value on the intensity gauge - If enabled the % value (procent of max heart rate) on the Gauge will be colored in the same color as the current zone. 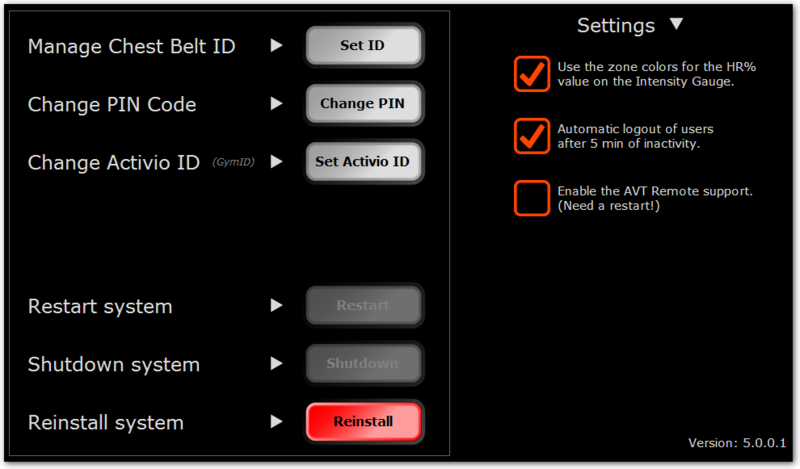 Automatic logout of users after 5 min of inactivity - If no heart rate data is transmitted from the chest belt to the system within 5 minutes the users is marked as inactive and the system may automatically logout the user. Uncheck this to not logout users automatically.